In the final episode of Season 2, one of you asked us if we had anything special planned for the release of Season 3. We said that indeed we did, but it was a small project. A teensy-weensy-cutesy project - something we wanted to do merely for the fun of it. This will be a new section on our website where we'll document letters we write to one another every week. With each passing day, we've been finding ourselves more and more frustrated by the less and less time we've had to communicate with each other. In the past few months, we've sometimes found ourselves communicating merely with the aid of emojis. In fact, Ankita's misuse of the poop emoji may have been the reason why this new segment was created. So starting this season, we're going to be writing letters to each other detailing all the "unimportant" things happening in our lives - all the things we once used to exchange on long phone calls with each other on a daily basis. And the best part? We're including you in our conversations. Once upon a time on a cold February morning, Meenal made the mistake of sending this video to Ankita. Ever since, Ankita's been talking in a Southern Texan accent. The accent would have been fine on its own but Ankita related to Barb Kellner on a spiritual level which resulted in her addressing both herself and Meenal as 'Barb'. The rest is history. Meenal changed Ankita's contact name on her phone to 'Barb Kellner'. Ankita is still technologically handicapped so she did no such thing. Nevertheless, they both call each other 'Barb'. 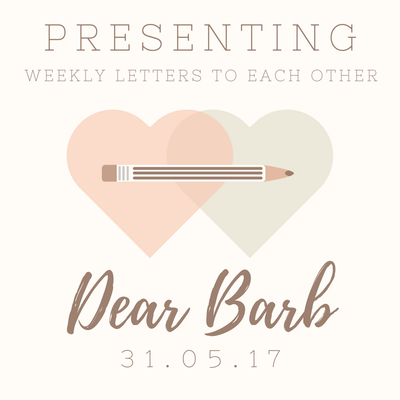 The letters you will read in this section are from one Barb to another. Be prepared for some confusion. But we can also promise you entertainment!